Chemically and biologically functionalized piezoelectric sensors are attractive alternatives to surface-sensitive transducers due to their surpassing versatility. 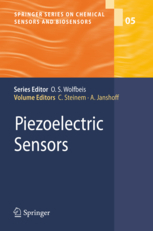 The fourth volume of the Springer Series on Chemical Sensors and Biosensors includes a comprehensive theoretical treatment and current state-of-the art applications of the quartz crystal microbalance (QCM). Interface circuits and the study of viscoelasticity and micromechanics as well as surface roughness with the QCM are discussed. The broad field of analytical applications of piezoelectric sensors is covered, which ranges from nucleic acid detection, immunosensors, protein-membrane interactions and monitoring cells by imprinted polymers to the viscoelastic response of living mammalian cells on QCM-resonators. Sophisticated derivatives of the classical QCM, such as rupture event scanning, the use of extraordinary high frequency crystals, and electrochemical QCM, clearly reveal the advantages of combining multiple techniques to realize new detection schemes on the basis of piezoelectric resonators. ContentsPart I: Physical Aspects of QCM-Measurements: Ralf Lucklum, Frank Eichelbaum: Interface Circuits for QCM Sensors.- Diethelm Johannsmann: Studies of Viscoelasticity with the QCM.- Michael Urbakh, Vladimir Tsionsky, Eliezer Gileadi, Leonid Daikhin: Probing the Solid/Liquid Interface with the Quartz Crystal Microbalance.- Diethelm Johannsmann: Studies of Contact Mechanics with the QCM.- Part II: Chemical and Biological Applications of the QCM: Franz L. Dickert, Peter, A. Lieberzeit: Imprinted Polymers in Chemical Recognition for Mass-Sensitive Devices.- Maria Minnuni, Sara Tombelli, Marco Mascini: Analytical Applications of QCM-Based Nucleic Acid Biosensors.- Robert D. Vaughan, George G. Guilbault: Piezoelectric Immunosensors.- Claudia Steinem, Andreas Janshoff: Specific Adsorption of Proteins on Solid Supported Membranes.- Vanessa Heitmann, Björn Reiß, Joachim Wegener: The Quartz Crystal Microbalance in Cell Biology: Basics and Applications.- Part III: Applications Based on Advanced QCM-Techniques: Yoshio Okahata, Toshiaki Mori, Hiroyuki Furusawa: Enzyme Reactions on a 27 MHz Quartz-Crystal Microbalance.- Kenneth A. Marx: The Quartz Crystal Microbalance and the Electrochemical QCM: Applications to Studies of Thin Polymer Films, Electron Transfer Systems, Biological Macromolecules, Biosensors, and Cells.- Fredrik Höök, Bengt Kasemo: The QCM-D Technique for Probing Biomacromolecular Recognition Reactions.- Matthew A. Cooper: Resonant Acoustic profiling (RAPTM) and Rupture Event Scanning (REVSTM) .